Does anyone eat succotash anymore? Traditionally made with corn and beans (usually lima beans), this side dish seems a bit old fashioned…or it did until this recipe came along! Succotash’s history reaches back to the early days of our country. A Native American stew made from corn, beans and a bit of meat, it was adopted by the early English settlers as a way to ward off starvation when other food sources weren’t available. 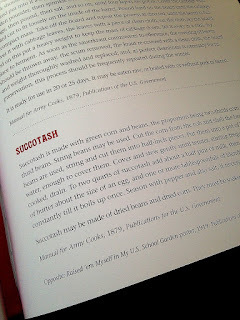 Succotash was probably on the menu that first Thanksgiving in Plymouth, Massachusetts. 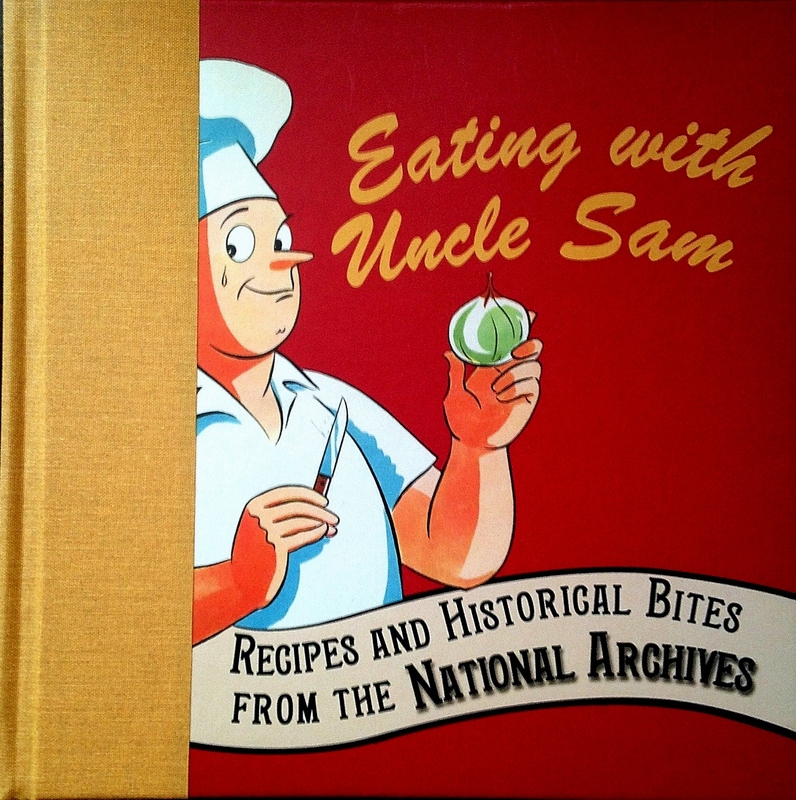 Recently, the Kansas Museum of History featured an exhibition called What’s Cooking, Uncle Sam? The Government’s Effect on the American Diet. Created by the National Archives and Records Administration, the exhibit detailed the Government’s impact on how we eat every day, from what is grown on farms to recipes served on dinner tables across the country. It also explained how economic hardships, wars, and other historical events impact our food choices. 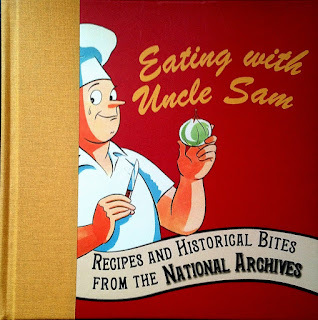 A cooking class was part of the exhibit, featuring recipes inspired by ones in Eating with Uncle Sam: Recipes and Historical Bites from the National Archives, which was published to go along with the What’s Cooking, Uncle Sam? exhibit. 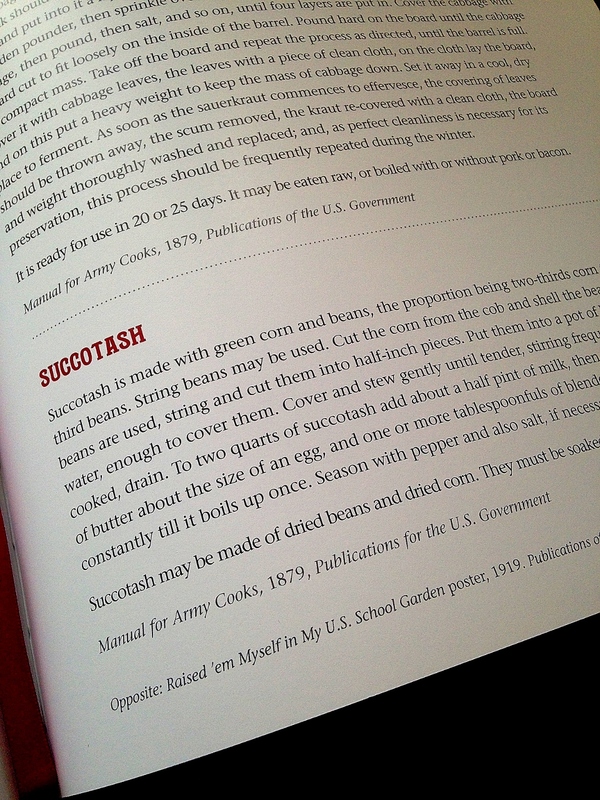 The succotash recipe in the book was from an 1879 Army cooking manual and called for the cooked vegetables to be made in a cream sauce. My mom told me that is how she remembered it being made, but growing up we often had corn (or hominy) combined with lima beans on their own and called it succotash. At least, that’s how I remembered it. At the cooking class, dietician Amber Groeling came up with a modern-day version that works both as a side dish or a main course. 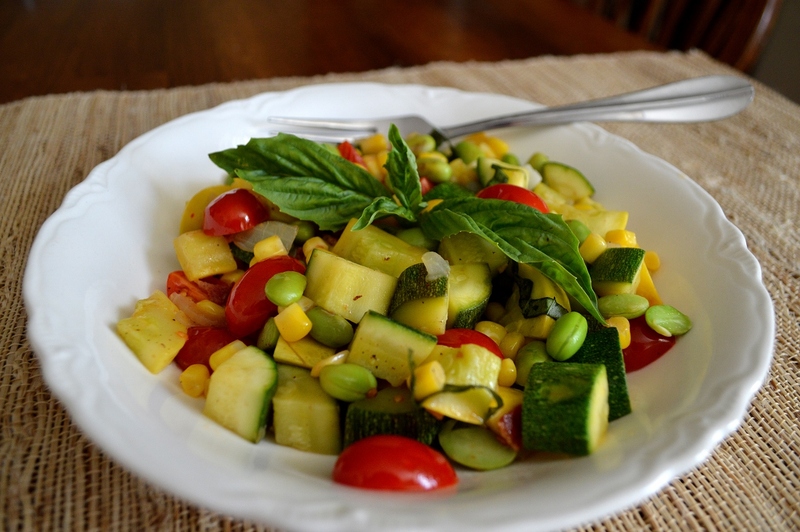 Her version added many more vegetables, swapped the Lima beans with shelled edamame, and dressed it with fresh basil, olive oil, and tarragon vinegar. Since tarragon vinegar isn’t something I keep around, I swapped it for red wine vinegar. I also upped the amount of bacon from 2 slices to 3 for more flavor, and used cherry tomatoes instead of one whole tomato. That’s what is great about this recipe…you can tinker with it to fit your own tastes very easily. Soon I plan to try it with lima beans instead of edamame. 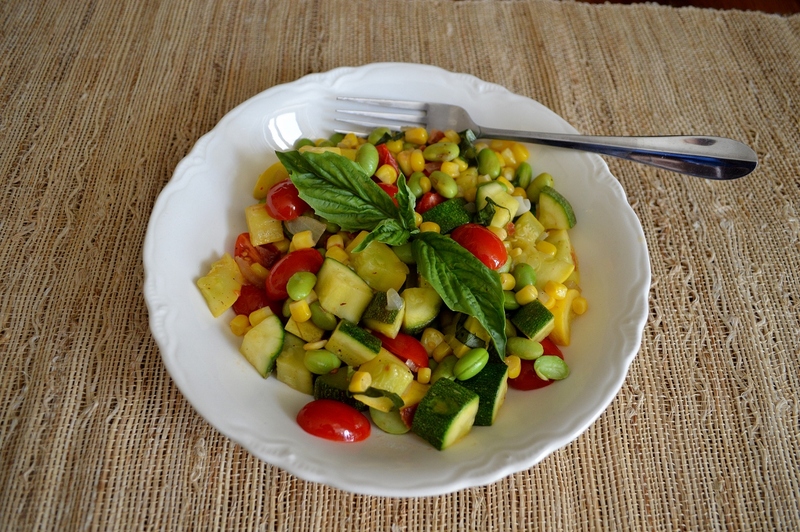 I enjoy this succotash as a one-skillet supper on warm summer evenings, but it would also work well as a side dish to grilled or barbecued meats. You can make it a vegan dish by skipping the bacon and using olive oil instead. It tastes wonderful both served warm or at room temperature. 1/4 cup fresh basil, cut into thin ribbons. In a 12-inch skillet, cook the bacon until crisp. Set the cooked bacon aside. Into the skillet in the hot bacon fat, add the onion and cook until translucent, about 5 minutes. Next, add in the corn, zucchini and squash. Cook until the zucchini and squash start to become tender, about 5 to 10 minutes. Add the edamame, cook until warmed through. Chop the crisp bacon and stir into the mixture, along with the sliced tomatoes. Turn off the heat and add the vinegar, oil, salt, pepper and basil. Adjust seasonings to taste. Serve warm or at room temperature. Hi Jane! I'm afraid I have no idea how many calories are in the dish. I wouldn't think much since it's mostly veggies, especially if you remove the bacon. With the edamame, you don't even need to add the tofu! Hope you give it a try.